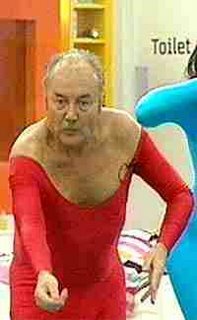 George Galloway prances about in his unitard. Of course, I’m talking about outspoken and often outrageous Scottish MP George Galloway, who has been denied entry into this country by the Harper government. Technically, the government is in its rights to do so, as Section 34(1) of the Immigration and Refugee Protection Act bans entry into this country of individuals who provide “material support” for terrorist groups. Mr. Galloway has admitted to giving money to Hezbollah and Hamas, groups that the current Canadian government has deemed as terrorist; and he has spoken openly of his admiration for those groups. Mr. Galloway is a bit of a contradictory character. On one hand, he’s very much a public buffoon who pranced about in a unitard on UK’s reality show Big Brother, where he also engaged in a creepy, fetishized feline impersonation. On the other hand, he is a firebrand debater and activist who is known for his great public battles with intellectual stalwarts like Christopher Hitchens. Love him or hate him, there’s no denying that his is a very entertaing show. American actor John Malkovich, while addressing students in Cambridge in 2002, famously proclaimed that he would like to “shoot” Galloway. Malkovich, noted for his pro-Israel views, was investigated by the British government, since uttering death threats –especially against a sitting politician– is very much legally problematic. But ultimately Malkovich was permitted to continue his speaking tour of the UK unmolested. That affair presents an interesting mirror to the events in Canada this past week. Every day at every border of this nation, individuals are turned away. They are denied entry because of fraudulent or insufficient documents, suspicion of criminal activity or, frankly, as a result of a personal whim by an immigration inspector. Mr. Galloway’s case is a bit different, due both to his standing as a member of the government of one of Canada’s closest friends, and in the way that responses to his barring have been sorted stricty between this country’s political poles of Right and Left, suggesting strongly that the underlying reasons for his denial are more political than having to do with concerns over national security. It can be argued that Mr. Levant’s defence of free speech may extend only to those whose platforms he supports, a position that sadly continues to define political discourse in this country. The “violations of criminal code” mentoned by Mr. Levant refer to the possibility that Mr. Galloway would be using his visit to Canada to drum up financial support for terror groups. That would indeed be a criminal action in this country. However, a speaking tour is not necessarily a fund-raising tour. A true champion of free speech would insist on Mr. Galloway being given his soap box, but with strict policing oversight to make sure no criminal lines were crossed. I therefore suspect that for many on the political Right, what is ostensibly a matter of national security –or of “soverignty”, as Mr. Levant puts it– is actually based on political distaste. The Galloway affair thus represents an opportunity for Canadians to be introspective and galvanize our feelings on freedom of expression. We are not truly an inclusive society until we include those with whom we profundly disagree. Frankly, while it is true that Mr. Galloway has no overt right to enter Canada and speak to Canadians, this is not really about him. It’s about us. Mr. Galloway was invited by Canadians to speak to Canadians. Barring him entry punishes the people of Canada by denying us access to a voice that apparently many want to hear. The same logic would apply to any politically polarizing figure. That line can quite easily be interpreted to classify former President George W. Bush as an undesirable entrant into Canada. Yet earlier this month, Mr. Bush was welcomed with open arms in Calgary, stronghold of the current Conservative government. The prevention of Mr. Galloway’s visit is not an expression of legal correctness nor even a repudiation of the man’s polarizing views. Rather, it is a fairly transparent attempt by our Conservative government to define and hue discourse in this country by selectively controlling which voices to which Canadians shall have access. It is a profoundly undemocratic practice.